The word 'canvas' is a corruption of cannabis or hemp from which it was formerly made, as also were such nautical gear as ropes, sails and fishing nets. Linen was also made from hemp. So important was this crop that the last Queen Elizabeth in 1563 decreed that every farm of 60 acres or over must have at least one acre devoted to hemp growing. The Tudor penalty for not growing hemp, first imposed by Henry VIII in 1533, was at least as high by the standards of the time as the penalty exacted by the present Queen Elizabeth for the opposite crime of cultivating the stuff — a stiff £5 or five golden sovereigns. Nor was it easy to avoid the compulsory cannabis law. The business of detecting and fining hempless agriculturalists was a profitable one. Queen Elizabeth I licensed agents by Letters Patent to form local drug squads in reverse, who enjoyed the monopoly of extracting money from those rustic lawbreakers who refused to grow their due share of the cannabis crop. Many did refuse, saying that their land was not suitable for hemp growing, but the alliance of central bureaucracy and local gangsters allowed no exceptions, and the revenue from cannabis evasion was considerable. Finally, in 1593, the voice of the protesting peasantry reached the ears of Authority and the Hemp Laws were repealed. In one of his articles on local history for a South Norfolk newspaper in August 1963, Eric Pursehouse quotes extracts from the numerous 18th and 19th century records which illustrate the importance of hemp cultivation to village economy. It flourished best in "old meadows and low bottoms near rivers". The valley of the Waveney between Norfolk and Suffolk was the centre of the hemp country, producing about an eighth of the total English harvest. A tithe or tenth part of the crop in every parish belonged to the vicar. The custom at Diss in South Norfolk was to stack his share of the hemp in the church porch. Whether any of it found its way into the churchwarden pipes of the village elders is not recorded. 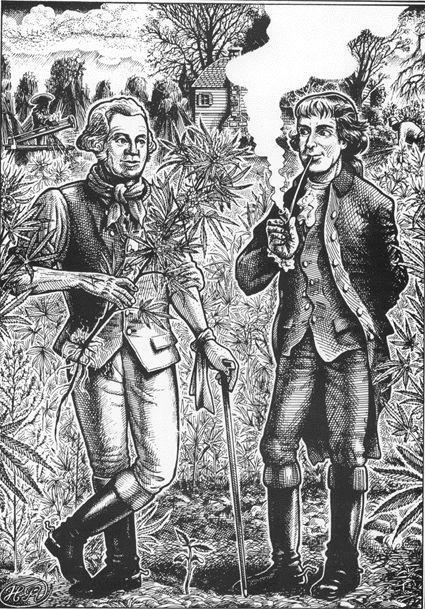 Hemp growing in East Anglia reached its peak in the 18th century when stands of it were to be found in thousands of gardens and small fields. According to Kirby's Suffolk Traveller, written in the 1730s: "The district in which hemp is chiefly found extends from Eye to Beccles, spreading to the breadth of about 10 miles, which oblong of country may be considered its Headquarters. It is in the hands of farmers and cottagers. With cottages it is the practice to sow on the same land each year. Manuring of 16 loads of dung per acre receives great attention. Sowing is from mid to end of April, but it will bear till May. No weeding is given, for Hemp destroys every other plant." By the beginning of the 19th century the decline of English hemp growing had begun. It followed the decline of local independence and the destruction of the village economy which resulted from the enclosures of common lands, engrossing of farms and the rising power of manufacturers and centres of capital. The increase of wheat prices with the Napoleonic wars made it profitable to turn the old hemp fields over to corn. Cobbett in his ride through East Anglia in 1821 makes no mention of hemp cultivation, although Arthur Young on his visits to the same area about twelve years earlier had found it diminished but still active. It lingered on, however, almost into living memory. Mr Pursehouse records conversations with aged East Anglians whose parents were hemp spinners, and Enid Porter, formerly of the Cambridge Folklore Museum, has a note of hemp being sold in the Cambridge market in the early years of the present century. Having been a feature of English village life and in- dustry for literally thousands of years, the hemp plant has left its mark on native customs and place names. Hempstead in Essex is an example, and Hempnall in South Norfolk was evidently a hemp knoll or hillock, a name found elsewhere about the country. As well as having traditional healing properties, hemp seed had a most interesting use in magic and divination. Scattered at midnight with a suitable charm, it would summon up an image of one's future lover. Midsummer Eve or Hallowe'en, according to Brand's Popular Antiquities, were the appropriate seasons for this ritual which is chillingly described in a poem called 'The Cottage Girl'. Lo! shuddering at the solemn deed She scatters round the magic seed, And thrice repeats 'The seed I sow My true-love's scythe the crop shall mow.' Straight, as her frame fresh horrors freeze, Her true-love with his scythe she sees. In the fenland districts of Cambridgeshire, where the crop was widely grown, local people recognized the soothing, therapeutic properties of the hemp plant's leaves and seeds. According to Enid Porter's book, Cambridgeshire Customs and Folklore, the smoke from a pipe full of crushed hemp seeds mixed with tobacco had a wonderful effect on fractious babies, and peaceful evenings for the parents were further procured by pipes of dried cannabis leaves or cups of poppy tea. One of the secrets of the old East Anglian horsemen was that crushed hemp seeds in one's pockets attracted and pacified unruly horses. It is an odd turn of legal history that the hemp plant, which until so recently was an integral part of English country life, economy and culture, should now be an outlaw. From cottager's friend to devil's weed in the space of a few years represents a mighty feat of image-shifting for a humble vegetable. The swing of fashion against hemp, which began early last century, has reached such an extreme that it will naturally correct itself before too long. When it is again possible for its useful and picturesque qualities to be appreciated, outside the context of drug hysteria, the hemp plant will be free to resume its normal character as an ornament and support to decent human society.